Planning to make a visit to your favorite city but don't want to spend much money for your trip? Well, worry no more. Travel price drop and deal finder tool, called Hitlist is here to help. HitList is a mobile application designed to monitor favorite travel destinations and sends alert to its users when promotions and/or fare rate cuts are available. The app works by providing its users with the recommended travel places as well as important travel tips. Once you already have chosen your target destination, the app will then do its job to send you with the best deals offered via price alerts. It will scan millions of fares and then give you the best itineraries so you will know of the optimal time to travel. HitList offers a Tinder-like interface which you can swipe "yes" or "no" when you are presented with details about your selected destination. The cities will be shown to you along with a photo and a standard price. The cheapest fare you would see from your home airport will also be indicated. HitList is also integrated with Facebook, allowing you to know which of your friends live in your chosen destination or have been in that place. The app can also tell you who of your friends want to visit the place. All you need to do is tell Hitlist where you would like to go and in respond, it will tell you when to go. But instead of asking you to configure a price range you are willing to pay, Hitlist will just lump fare drops into three broader categories as: Good, Great and Spectacular. These respectively denote roughly within 25%, 15% and 5% of the cheapest price. 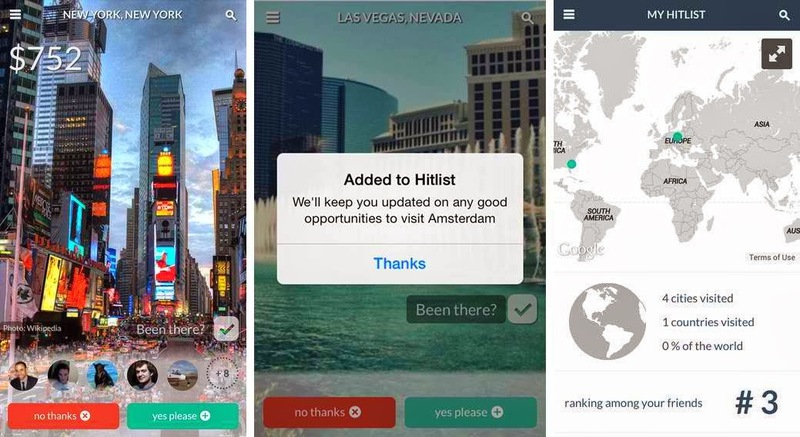 The Hitlist mobile app is created by TripCommon, a group of travel-focused company originally founded by Timo de Winter and Gillian Morris in 2012. TripCommon's Hitlist travel app is available on the App Store and Google Play, now live for both iOS and Android smartphone users.